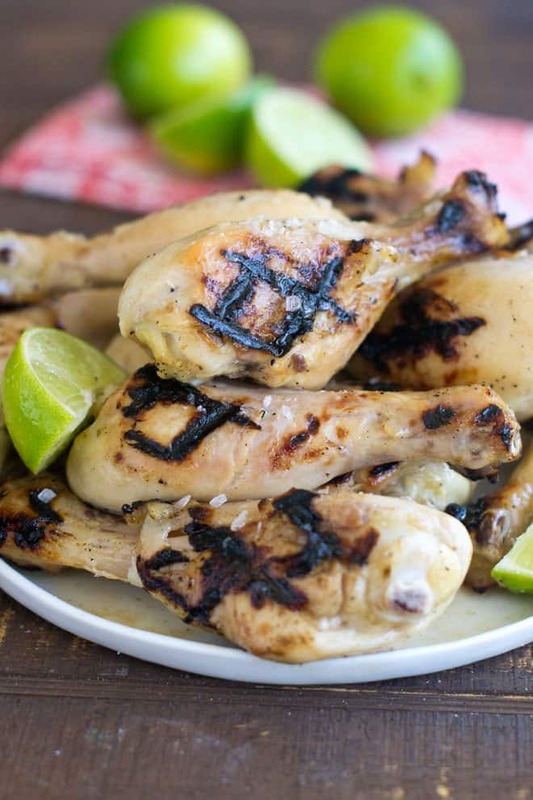 Get this delicious recipe for grilled chicken that has all your favorite margarita flavors. It’s tender, juicy and tasty every time! 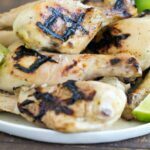 These Margarita Chicken Legs have tons and tons of delicious margarita flavor. Think tequila, lime, agave nectar and salt. I’ve taken these to three potlucks and I also served them at our last 4th of July party. I got so much amazing feedback. And, my pan of chicken went home empty. Always a good sign. The method for cooking this chicken might be familiar if you’ve been to my site before. It’s one of my favorite methods and comes from one of the most popular recipes on the site. This is my absolute favorite way to grill chicken. You can get all the details over here: Make-Ahead Grilled Chicken for a Crowd. They’re basically baked low and slow first. Then you cool them. Shortly before you’re ready to eat you grill them. You get tender, juicy, slow-cooked chicken that has a delicious grilled char flavor. It’s perfect for cooking for crowds because you never have to worry about under-cooked or over-cooked meat. You know it’s done just right every time. For today’s recipe, most of the flavor magic happens after the grilling. 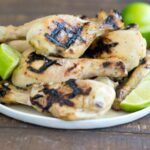 When the chicken comes off the grill, you drizzle it with agave nectar, squeeze on some lime and then, the best part, sprinkle it with coarse crunchy sea salt. It’s got that perfect sweet, sour, salty thing going on. So so good. Enjoy! Preheat oven to 300ºF. Line a large pan with foil and spray it with cooking spray or rub it with some olive oil. Put the chicken in a single layer on the pan. In a small bowl combine 1/4 cup of the agave nectar, tequila, table salt and black pepper. Drizzle it all over the chicken pieces. Bake for 1 hour. Test that it has reached 165ºF using an instant-read thermometer. Let cool for 15 minutes on the counter. Cover and refrigerate until guests arrive. Brush chicken all over with the olive oil. 15 minutes before eating, prepare grill for direct cooking over medium-high heat. Add chicken pieces and cook until grill marks appear on underside, 4-5 minutes. Flip and cook until heated through, another 4-5 minutes. Remove chicken from the grill and put in a single layer on a serving plate. Drizzle chicken with the remaining 1/4 cup agave nectar and with the lime juice. Sprinkle with the coarse sea salt. Serve. This post originally appeared in August, 2016 and was revised and republished in May, 2018. Disclosure: This post contains an Amazon affiliate link meaning that if you click it and buy something I will receive a small commission. This is at no additional charge to you. All opinions are my own.